Winter is in full swing (though not really here in Phoenix)! However, what January really means is we are back with another year of partnering with Phoenix Public Market to create recipes! This year’s recipes are going to be a little different than last year’s. These new recipes will not only feature the great items from the market, but they will also be themed! Our first recipe is inspired by A Goofy Movie! 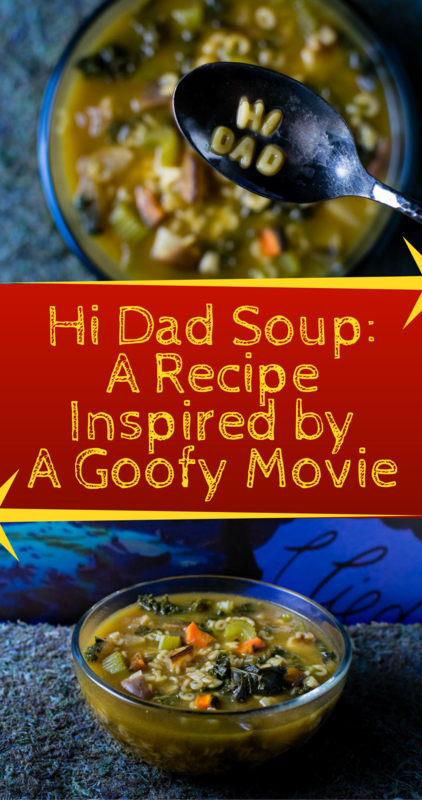 We’re excited to share our recipe for Hi Dad Soup! One of the tribulations the pair faces on their trip is being stuck in the car by Bigfoot. While they are stuck, they share a can of vegetable soup. In this tender moment, Goofy reminds Max that he used to spell out “Hi Dad”. 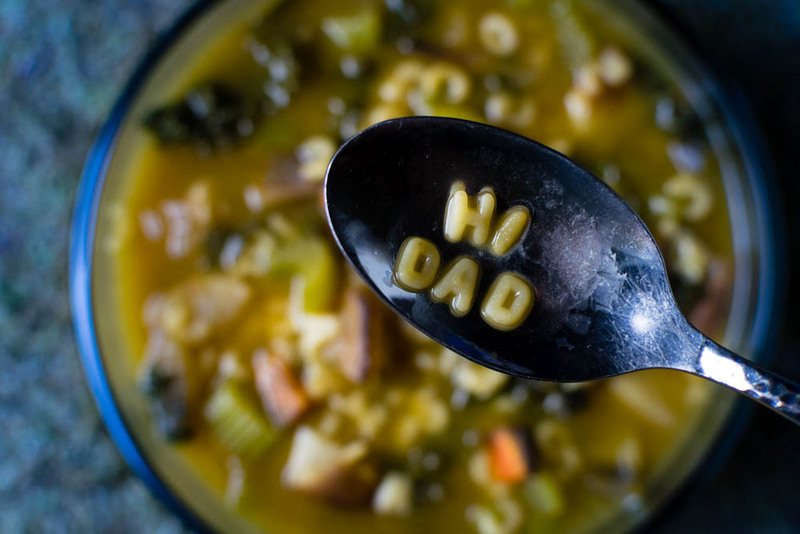 This Hi Dad Soup recipe is perfect for January for a couple of reasons. First, January is National Soup Month and second, there are a ton of great veggies available at the market! Our Hi Dad Soup is loaded with delicious veggies! 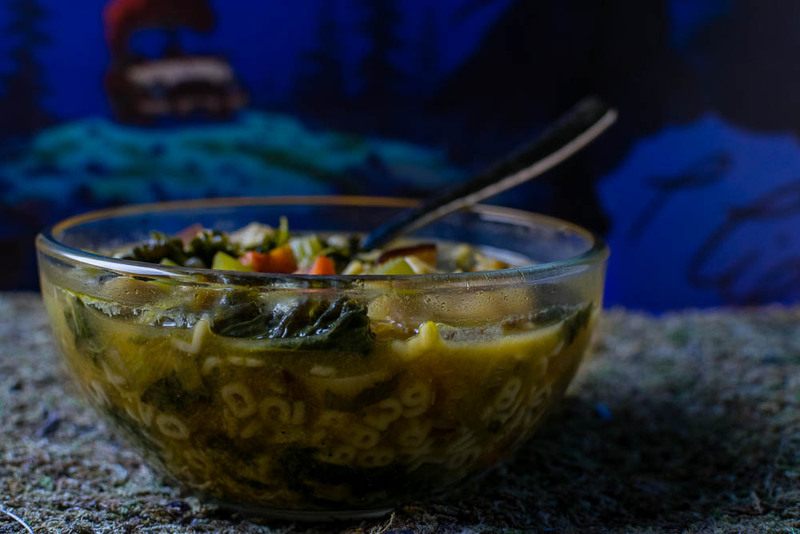 In fact, if you remove the noodles or find egg free alphabet noodles this soup can be vegan! Our vegetables came primarily from 3 of the vendors at Phoenix Public Market. We used kale, parsley, leeks, and celery from Blue Sky Organic Farms. The beautiful multi-color carrots came from Maya’s Farm. Finally, our turnips came from Steadfast Farm. One of the great things about this recipe is that you can switch out the veggies to your taste. We hope you enjoy trying out the first of our new themed recipes for Phoenix Public Market. What fandoms would you like to see? Leave a comment below or tag us using the hashtag #GeekEats! Stay tuned because next month we have a really fun recipe planned! Peel and cut carrots into quarters. Cut top and bottoms off of turnips and quarter. Cut greens and bottoms off of leek and cut in half lengthwise. Place carrots, turnips, and leek on lined baking sheet. Drizzle with oil, salt, and pepper. Roast for 40 minutes, turning at the 20 minute mark. Remove from oven and chop carrots and turnips into bite sized pieces, set aside. In a soup pot combine stock, kale, parsley, leeks, garlic powder, and bay leaf. Add carrots turnips, and noodles. Turn heat to medium and cook until pasta is done. Awwww (I’m printing this recipe to try it out). At this pace, I’ll end up printing all the recipes from this blog!! !